Snuggle up with your kitty and read these action-packed tales aloud to him or her. They are very funny stories about the things cats like to do, and they have lots of amusing pictures. Invite your cat to come hear a story - but ask nicely! Cats hate being told what to do. True Kelley has illustrated many books for children, including Stay! Keeper's Story by Lois Lowry. She lives with children's author Steven Lindblom and their daughter, Jada, in Warner, New Hampshire. 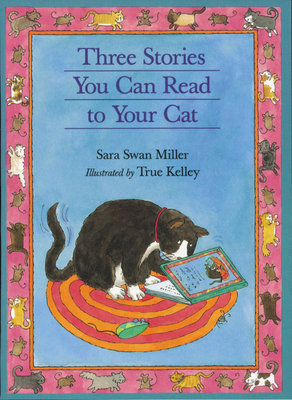 Sara Swan Miller is the author of Three Stories You Can Read To Your Dog, Three Stories You Can Read To Your Cat, Three More Stories You Can Read To Your Dog, Three More Stories You Can Read To Your Cat, and Three Stories You Can Read To Your Teddy Bear. Shy, bold, and feisty by turns, Kelley's cat is positively purrfect as it stalks and capers its way through three episodes that depict a feline's winning ways. Pictures catch a range of emotions--from a sly stare when Kitty sees a tempting bug to a self-satisfied gleam after it has spent a wonderful day doing naughty things. Miller's stories, written using the pronominal you ("One day you [the cat] woke up early"), are funny as well as easy to read, making them great for new chapter-book readers, especially ones who have cats to cozy up with.